WWT London Wetland Centre is one of those places, Mama thinks, which is not obviously going to appeal to a toddler and her Fabulous Big Brother, even if he is obsessed by all things animal. It sounds like somewhere where serious people go and watch birds seriously from small, serious huts where you are not allowed to make noise and are expected to sit seriously still for extended periods of time. None of these are things we are good at. Plus, we might not see anything more exciting than a seagull, even if we do manage to get to grips with binoculars, and frankly, we can nip the five minutes down to the Thames any day of the week to look at seagulls, with the added bonus that we might get to feed them and chase them a bit too. 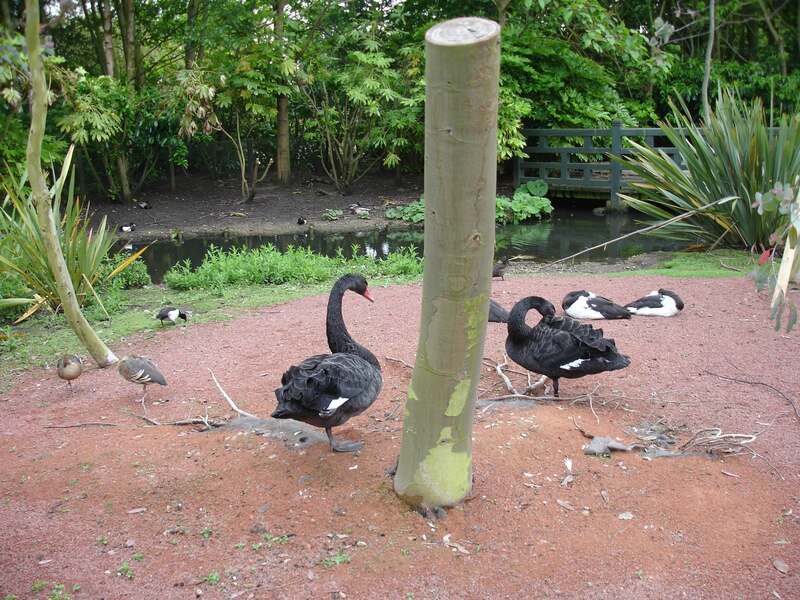 As it turns out, the WWT London Wetland Centre is a bit like this. But only a bit and it is also so much more. It is, in fact, one of the best places to take small children in the whole of London. Mama thinks. And so do we. As well as the extensive lake ringed by hides, there are also a large number of small artificial habitats where you can get up close and personal with the naked eye to collections of semi-captive water birds from around the world. It always surprises Mama that what are, essentially, ducks, albeit large ducks, small ducks, ducks with blue beaks, spoon billed ducks, white ducks with black polka dots, brown ducks, grey ducks, stripy ducks, ducks with golden eyes, tufty-headed ducks, diving ducks, waddling ducks, huge black ducks that look suspiciously like swans and so on can hold our attention to quite the degree they do, given how often we visit the local parks, which have themselves quite a duck collection of their own, but hey. They do. 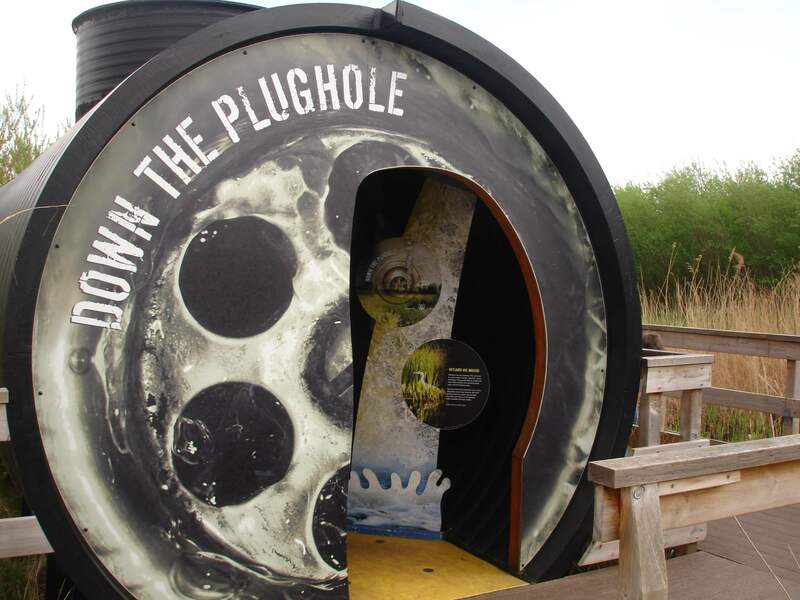 But if you are a wildlife fanatic, you do not just go to the WWT London Wetland Centre for the birds. No, you go for the otters. Situated to the left of the entrance, they have an extensive outdoor enclosure and three feeding times when the Centre is open, at 11am, 2pm and 4pm, although you can often see them out and about at other times too. They are CUTE! They are cute when they eat with their cute little hands, and cute when they swim, playing with each other cutely in the water. Cute! A must see. Mama is there for the surroundings. 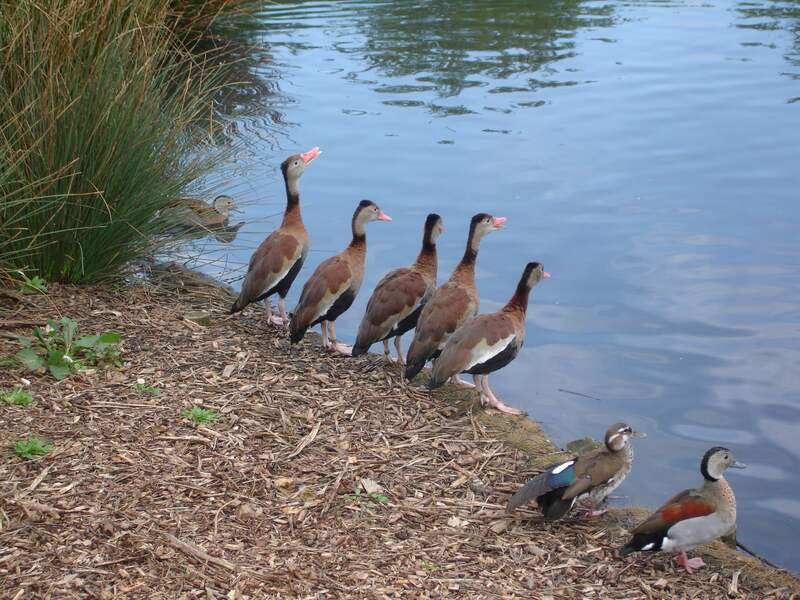 You can go from the world duck zone through an intriguingly large gatehouse promising all sorts of safari like fun straight into a countryside walk. Lots of long grass, reeds, overgrown watery areas and short British trees. I think it’s probably because the wilder birds like that sort of environment, but Mama clearly thinks it’s her own personal sanctuary from the existential stress of living in a place surrounded by man-made structures and traffic jams for 300 miles each way. From my Fabulous Big Brother’s point of view there is not quite enough of a guarantee of wildlife sightings, but we have encountered frogs, there is a vague promise of voles, and in summer the place is humming with insects, especially easy to spot brightly coloured dragonflies, and the whole ramble is a much more manageable length than Mama normally makes us do if she manages to prise us out of an urban environment for an afternoon. Thus we do not protest too loudly when she drags us inside. There’s a similar sort of vibe to the territory in the other half of the Centre, back through the building complex near the entrance. 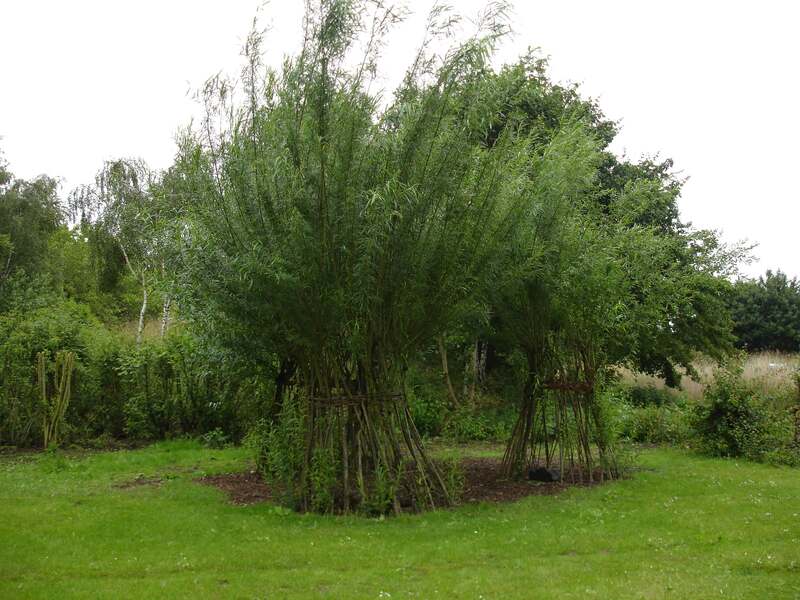 Our focus here is more on reaching the playground area, although we can get very distracted by poking around the insect garden and checking to see if we can see bats in the specially built bat house. So far, no. But one day! We’ve seen frogs round here too. 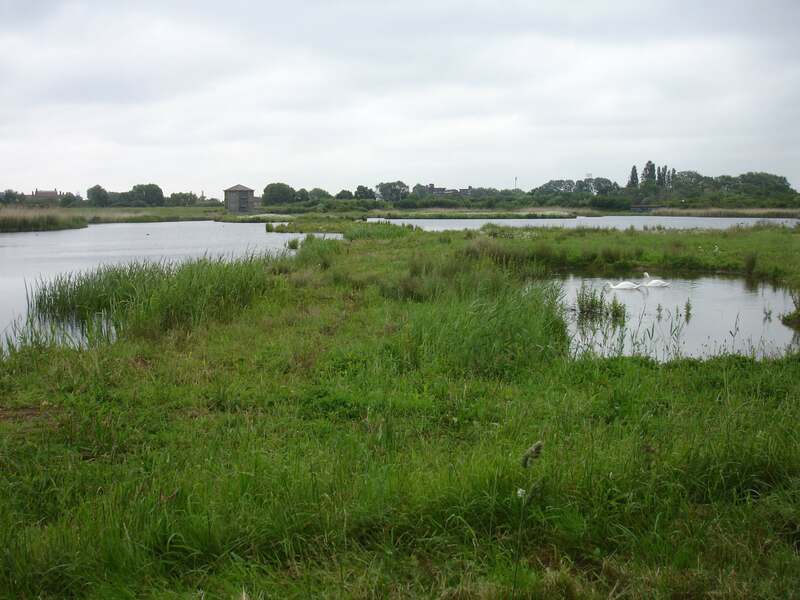 A tip: the area covered by the WWT London Wetland Centre is quite extensive. It’s all easy going, but it is one of the few places Mama still takes a pushchair to. Understandably, no scooters are allowed inside. The playground itself is one of those all divided up into different areas, which are all on different levels with bushes and such separating them off from each other and Mama’s line of sight. It’s great. We think. Because of the tunnels, mainly. Mama is less enthusiastic. Because of the tunnels, mainly. Mama no longer has to bribe my Fabulous Big Brother to look after me in them, which is excellent because the playground no longer rings either to the sounds my wails when he abandons me at the first opportunity, or his loud overprotective berration of any other child who dares to breathe in my direction (“That’s my SISTER! She is SMALL!! You be CAREFUL!!!”). But if Mama stays by the entrance near the exit, I will leave the tunnels at the other end and FLING myself in front of the teenagers sliding down the zipwire. If she stakes out that side, then she spends the whole time convinced we live to exit the playground and DISAPPEAR. Why she thinks this, when we have never show the slightest interest in doing so, and Fabulous Big Brother is old enough to understand not to anyway, I do not know, but there is is. She does. So she trots round and round the tunnels, trying to catch a glimpse of us inside. She thinks that to us she looks nonchalant as though she just happens to be where we are when we come out, but in fact, she just looks out of breathe and stressed. Hey ho. At least it’s exercise. There are also a water-play section, with a long trough populated with rubber ducks to soak your sleeves in and, oh marvel and wonder, SHOWERS! In hotter weather, children can dance around underneath them and get WET ALL OVER. Mama says, if only I showed this much enthusiasm for washing at home, but what I say is, it’s only fun if you get to do it in all your clothes. Mama therefore recommends that people who visit the WWT London Wetland Centre at the height of summer either take a few spare T shirts and trousers or go the whole hog and pack the swimming cossies and towels. Funnily enough, we have not been to the playground when the water section is open for quite some time. Since, in fact, the first time we stumbled upon it. The fun does not end there. It is probably true that some of our favourite bits about the WWT London Wetland Centre are indoors. Our absolute best is the Digital Pond. This is projected onto the floor of a hut in the Pond Zone and has various games which involve, for example, vigourously stamping on the projections of rubbish in order to make them fade away, or vigourously stamping on wiggly things so a mayfly larva will swim over and eat them, or vigourously stamping on excessive amounts of pondweed to get rid of it, or… well, you get the idea. Vigourous stamping abounds. This, I can assure you, is the very height of excitement, and we always pester Mama to take us there. The Pond Zone also has underwater cameras you can drive around, pond dipping opportunities and a whole building devoted to explaining what happens to your poo after you flush the toilet, which Mama says is a particularly genius bit of understanding your target audience’s interests and enthusiasms. 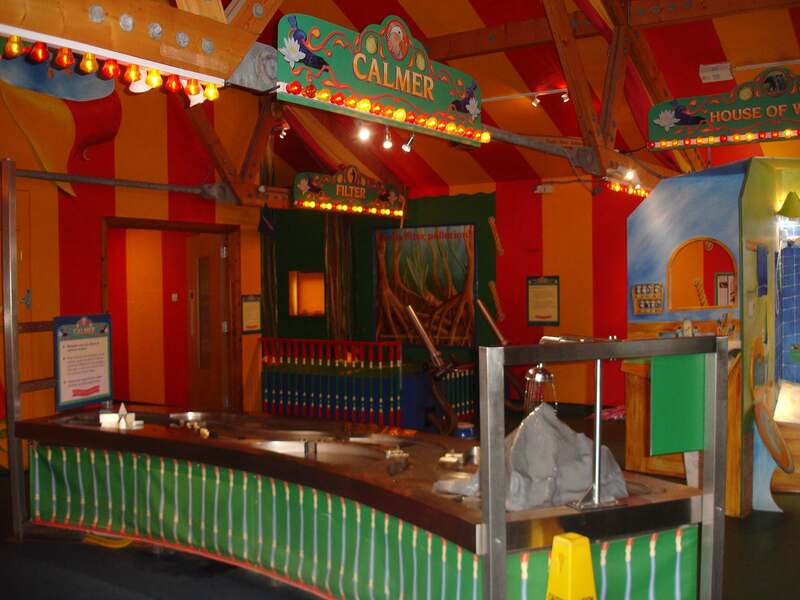 That said, we are also keen on the upstairs of the main buildings, which have water related fairground attractions, including shooting streams of water into holes to make the endangered wetlands animals stand up, pumping water into a globe so that it will spill out into ice caps and wine glasses and so on and yay, MORE water play involving building villages out of lego on simulated flood plains only to have them swept away when it rains on the hills! Mama, as you might be able to guess, is less thrilled with this guaranteed dampness opportunity. Luckily, our favourite game actually does not involve water, but shooting more poo (soft balls) out of pneumatic tubes towards holes signaled by reeds. There is probably a serious educational point to be made out of all of this, but we do not care. We even enjoy the approach through a sort of underwater Madam Tussauds, involving model sharks, crocodiles and poisonous frogs. And then there are the hides. Obviously if you are a serious bird watcher, you could head straight for these and spend hours and hours inside them, and judging by the lists of birds spotted that day Mama reads out to us sometimes, very profitably too. But we tend to just drop in for five to ten minutes at a time when we come across them as part of our rambles. And this approach seems to be working as we have seen a number of apparently interesting feathered flappy things. I’ll be honest – they all look much like yet more ducks to me, but Mama got very excited about the bittern (she says this is because of someone called Arthur Ransome), and she and my fabulous Big Brother spent the entire afternoon walking like the lapwing and giggling. In case you want to try it, you hold your body very still, with your arms straight down by your sides, bend your legs and walk really fast. Hours of fun. We are even learning hide etiquette (do not lean out of the windows and shriek loudly at the waterfowl), with the exception of remembering to bring some binoculars. Mama has never yet done that. Not that this matters if you go to the hide specifically designated as the family friendly one, the Headley Hide in the middle of the duck collections. They have binoculars and even telescopes for you to look through already set up, and also big picture windows for small people to gawp through easily. 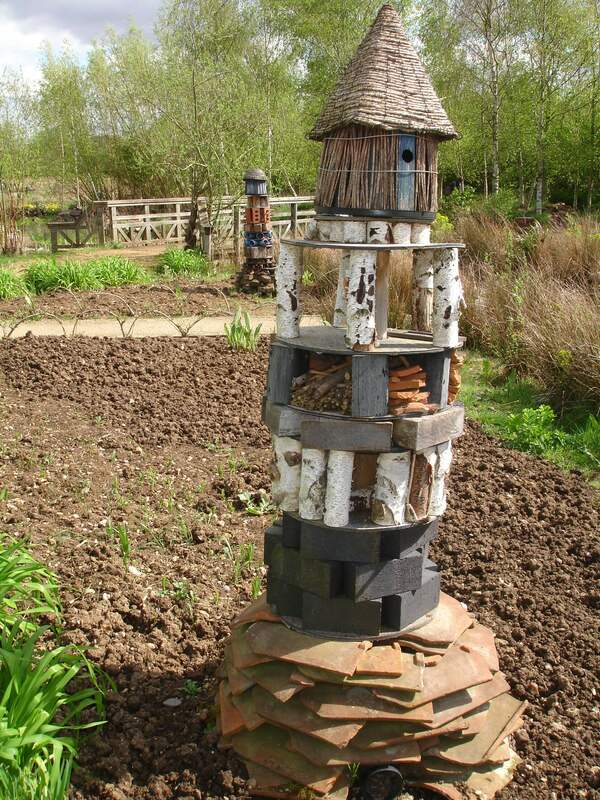 They have some bird feeders set up here too, and garden birds come quite regularly. Mama likes this. She attempts to lure them onto our balcony, but so far has only succeeded in persuading sparrows to dangle in front of our living room windows for her enjoyment. Although we do currently have swallows (or possibly swifts) nesting in our roof. This is impossibly cool, Mama thinks, especially when she is watching them swoop around looking for insects while sipping her coffee, but she does rather wish they weren’t right above my and my Fabulous Big Brother’s window. The baby birds are extremely piercing at six in the morning. So by now you should be convinced that the WWT London Wetland Centre is an interesting place to go, but Mama would like to mention another plus anyway. It it has, she thinks, a particularly good range of activites on offer. Especially, but not limited to, the school holidays and weekends. Things we have particularly enjoyed are the daily bird feeding walks at 3pm (don’t eat the pellets, throw them at the birds! ), the reptile finding walks (slow worms for us! Snooping over the back walls of the expensive houses bordering the Centre for Mama! ), the afore-mentioned pond dipping (I got wet! Hurrah! ), and the time they persuaded the man with the tanks full of scorpions, snakes, spiders and millipedes to come and show them off. They also do crafting, but we have never yet made it to a session, so engrossed are we in all the other things on offer. Which include food! There is a cafe serving a small but tasty range of teatime or lunchtime edibles, including chips and coffee, so everybody is happy. You can eat inside, but the real treat is taking your meal out to the pond and admiring moire ducks while you chow down. 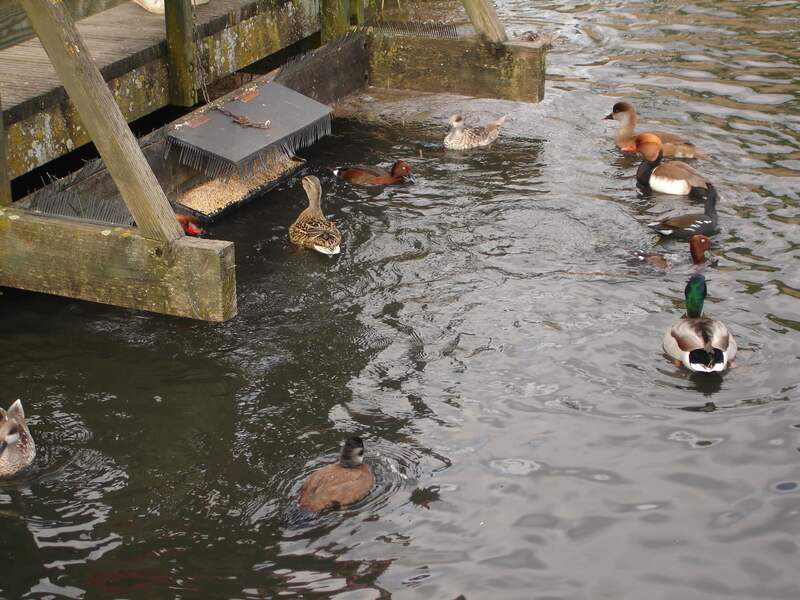 If you have brought your own food, which we often do, there are benches at regular intervals, and hand cleaning stations nearby so you don’t have to use up a packet of wetwipes cleaning the duck poo off your hands before you eat. I recommend the tables in the middle of the world duck zone next to some living wigwams. Great to play in and out of when you are bored of ham sandwiches. And! Mama has saved the best for last. There is a huge car park. Oh yes, there is! It is free for visitors to use – just remember to take the special exit token when you check in. Anyway. 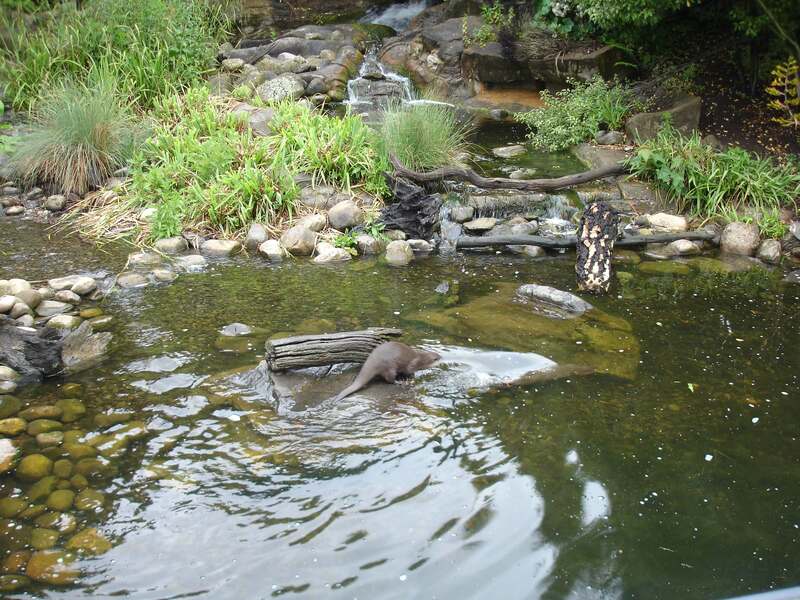 WWT London Wetland Centre is a MUST for anyone with kids and half way decent access to South West London. No really, it is. GO. In fact, go even if you do not have kids. It’s a proper grown up space as well as being child-friendly. The only downside is that it is a little pricy for a one-off visit, but the yearly memberships are more than reasonable particularly given just how much there is to do and see. And that membership will also get you into all the other WWT Wetland Centres around the country too, which if WWT Arundel Wetland Centre is anything to go by, are also FANTASTIC. The WWT London Wetland Centre website. This is what the Hitchhiker’s Guide to the Galaxy has to say about birdwatching. Opening: 9.30am – 6pm (summer), 9.30am – 5pm (winter). Prices: Adults £12.35, Concessions: £9.20, Kids over 4 years £6.90, Family £34.50. Annual family membership for one adult plus kids is £56, and for two adults plus kids is £72, and is well worth considering. By bus: The 283 from Hammersmith stops right outside the Centre. The 33, 72 and 209 stop a few minutes walk away. By train: Barnes or Barnes Bridge stations are about a 15 minute walk away. The 33, 72 (Barnes) and 209 (Barnes Bridge) buses also run past the stations if you don’t want to walk. By tube: Get off at Hammersmith (Picadilly and District & Circle lines) and then get the 283 bus. By car: Ample FREE car parking! Yay!